What Exactly Is Getting Things Done (GTD)? Do you feel overwhelmed with everything in your life right now? Are you unable to get the things done that you need to, in the time that you want to? Do you think life would be a lot simpler if you could just get organized and do things faster? If any of these sounds like you, then Getting Things Done (GTD), the system developed by productivity guru David Allen, may be exactly what you’re looking for. You have probably heard about it before from a friend or colleague (if you haven’t, try thinking of the most organized, productive people you know—they could be using the GTD system) but just don’t know what it’s all about. With many of the successful people today, GTD has turned into an essential system and developed its own cult following. What is Getting Things Done (GTD), and how can it help you? Getting Things Done isn’t some sort of magic trick. It’s a way of thinking and doing that has been turned into a complete system to help you become more productive. By increasing productivity both personally and professionally, users of the GTD system are able to spend more time doing the things they enjoy, have a decreased level of stress, and are able to ultimately enjoy life. One of the greatest things about Getting Things Done is that you don’t have to do a complete life change right from the start. You can slowly transition today and start making small changes in your life that will have huge impacts on your productivity. This will help you stick to the system and not feel overwhelmed and overloaded. One of the biggest problems people face with other productivity systems is that once you start you absolutely can’t stop. If you do stop, the system falls apart and you’re left more disorganized and unproductive than when you started. GTD isn’t like that, you can customize the system to fit your needs so you don’t have to worry about one tiny mistake ruining your whole system. A huge misconception about productivity is that it is relegated to the workplace. Life is much more than just work and GTD takes that into consideration. (tweet this) The Getting Things Done system will work not only in your professional work environment, but in your personal life as well. This will make you happier, healthier, and a lot more content with your life. Some of the greatest systems ever created to boost productivity have one major flaw: one change in routine or one single unplanned even will throw things off completely. If your boss decides to throw an unplanned conference during the time you are supposed to be meeting with someone, the system starts to crumble. Getting Things Done is adaptive. It was designed to allow you to work under pressure. In fact it makes working under pressure so easy that it doesn’t seem like pressure at all. With such an easy to implement system, there’s absolutely no reason why you shouldn’t give Getting Things Done a shot. Just a few (or even one) of the simple changes in this system can completely change the way you go through life. I hope that you have enjoyed reading this series of articles on Getting Things Done. If you have missed any of the articles in this series, you can find them here. Be sure to check out our next article on why GTD is able to help you succeed. 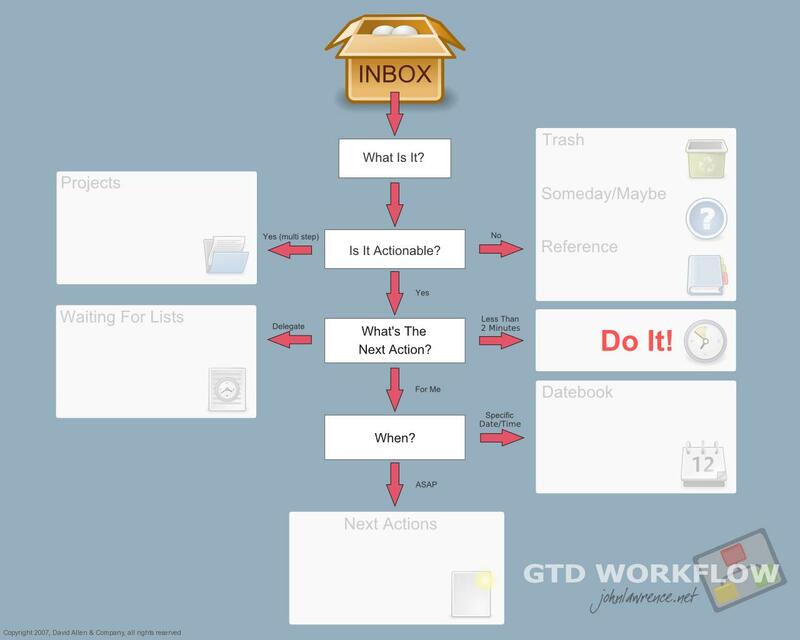 Have you tried Getting Things Done (GTD)? If so, how did they work for you? Comment here. If you are an Evernote user and would like to integrate Getting Things Done with Evernote, check out Evernote: The Unofficial Guide To Getting Things Done (GTD). This eBook will help you to become more productive by combining Evernote® with the best practices of the Getting Things Done methodology. It has helped over 13,000 people become increase their productivity over the last 12 months and it can help you today. Purchase a copy here. Hi Steve, really great article. Some really think that GTD implementation is painfull and hard, and your article shows how simple and easy is to start using GTD method. Annie, thanks for the tip. I will put this on my list of apps to check out.